Wish Upon a Wedding 9th Annual Blissful Wishes Ball! If you haven’t heard about the National non-profit organization Wish Upon a Wedding you absolutely NEED TO! Wish Upon a Wedding is a non-profit that grants weddings and vow renewals to couples facing serious illness or a life-altering circumstance. CHI thee WED is a proud sponsor and Nicole, co-founder of CHI thee WED sits on The National Board. Curators Brittany of Urban Allure Events and Olivia of Olive Fine Weddings are on the gala planning committee. The organizations biggest fundraising event of the year happens right here in Chicago and we couldn’t be happier to be a part of it! Wish Upon a Wedding has helped over 120 couples say “I Do” since its launch in January 2010. They believe that two people in love should never be denied the chance to marry their soul mate, and Wish Upon a Wedding provides this opportunity to those who have endured far greater challenges than many of us could possibly imagine. Wish Upon a Wedding allows countless of other wedding and hospitality professionals, to help people celebrate love, while encouraging those in the event planning industries to give selflessly to others. 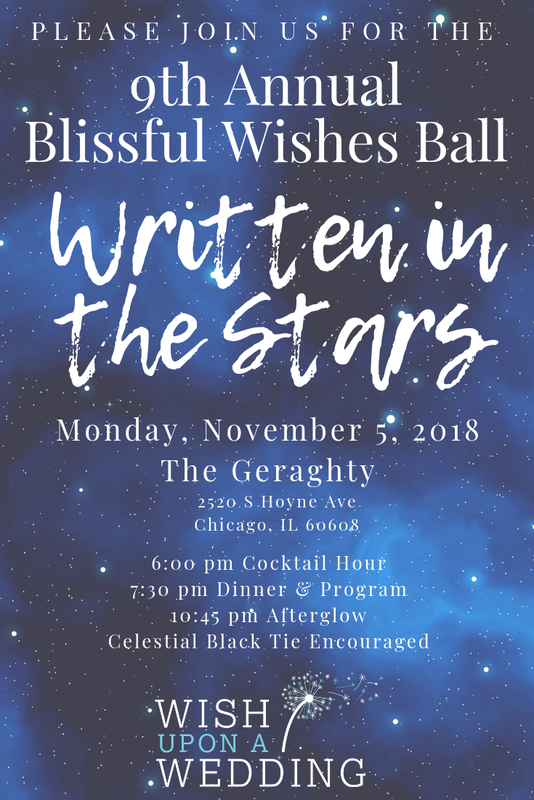 Please join us for a brilliant evening in celebration of the 9th Annual Blissful Wishes Ball benefiting Wish Upon A Wedding on Monday, November 5th, 2018! Come get inspired by the top wedding professional’s in the Chicago area and support couples in need! Get your Early Bird Tickets here before they are gone!